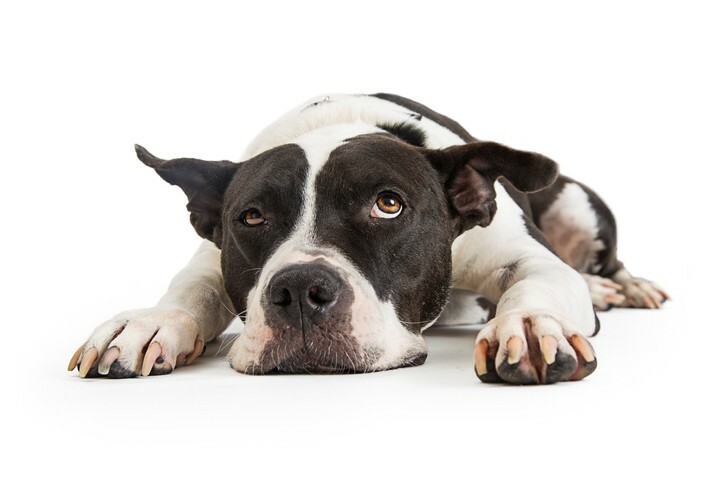 Understanding what happens in the dog’s body when the dog is stressed, what can trigger a stress response in a dog, and how to recognize stress-related behavior in dogs is important so we can respond appropriately to and help a dog who is feeling stressed. What is meant by the term “stress”? The Concise Veterinary Dictionary defines stress as “any factor that threatens the health of an organism or has an adverse effect on its functioning. Such factors or stressors may occur in the external environment or arise within the body”. When a dog is exposed to the stressor, the brain recognizes the trigger and the dog experiences physiological changes over which he or she has no control. Immediately, adrenalin is released, and the dog’s pupils dilate, blood pressure increases, senses are heightened, and the heart rate increases. These changes all help the dog to respond to potential danger. Over time, mental stress, anxiety and frustration have a profound adverse effect on the health of an animal. Dogs can be stressed by a variety of things. Being left tied for long periods of time, isolation, abuse as well as being lost can create stress. Real or perceived threats from other dogs can also create stress. Certain training methods can also elicit stress signals in dogs. The results of a study comparing the behavior observed in dogs participating in training classes at two training schools that used two different types of training methods results suggested that training methods based on positive reinforcement are less stressful for dogs. One school used positive reinforcement (where a food reward was given) in training while the other school used negative reinforcement (where an aversive disappeared when the dog complied). The dogs who attended the classes at the school using negative reinforcement displayed lowered body postures and displayed other signals of stress while the dogs who were trained with the positive reinforcement showed increased attentiveness toward their owners. Owners can identify stress signals in their own dogs. By looking at the whole dog and all the indicators one can interpret the dog’s behavior. When stressed, often the eyes will look rounder than usual and are opened widely, the whites may show. Generally, the dog will be looking away from the trigger or stressor, ears will be flat against the head, he may be panting or his lips are pulled up to reveal the front teeth or pulled well back to reveal front and back teeth. The tail may be tucked between his legs. His hair may stand on end and he may shed more than usual. Often stressed and fearful dogs will lean away, crouch, roll over, freeze and may urinate or defecate. They may vocalize also. Howling, whimpering, high-pitched repetitive barks and growling can all indicate stress and distress. Some dogs urine mark when feeling stressed. Recognizing the indicators of stress in dogs helps us make changes to reduce stress in dogs. Boden, E., & Andrews, A. (Eds.). (2016). Black's Veterinary Dictioary. New York: Bloomsbury. Deldalle, S., & Gaunet, F. (2014). The Effects of 2 training methods on stress-related behaviors of the dog and n the dog-owner reationship. Journal of Veterinary Behavior, 58-65. Market House Books . (1988). Concise Veterinary Dictionary. (R. S. Hine, Ed.) Toronto. Mills, D., Karagiannis, C., & Zulch, H. (2014). Stress—Its Effects on Health and Behavior: A Guide for Practitioner. Veterinary Clinics: Small Animal Practice, 525-541.